This new collection of five theatre-for-one plays, inspired by historical stories from around Herefordshire, is beautifully presented by the actors and puppets in a magical space created for you, the audience of one. Let About Face take you on a journey from pre-history tropical Herefordshire, taking in a wartime love story and encountering the Mermaid of Marden, a little-known legend from the County. A spinster spins tales of Leominster Gold and Hereford’s history passes by the windows of the Black and White House. My Apple Dumpling Girl is a story inspired by love. In a story of misdirected passion, set on a factory line, when Arlette’s apple-dumpling dreams go pear-shaped, who will pick up the pieces? What is the difference between a crush and true love? What are we prepared to go through to make someone love us? 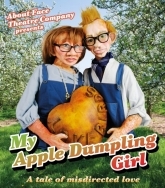 A memorable piece of theatre, My Apple Dumpling Girl explores issues of growing up, falling in love and making new relationships in an entertaining, colourful and creative performance. The show combines puppets and a stunning set designed by Purvin with beautiful multimedia shadow work by Nico Sergent and Suzie Owens, featuring original music by Mary Keith. Don’t Stare was originally commissioned for a Hate Crime conference in Worcester and has now been performed across Herefordshire for audiences of people with learning disabilities and carers. It has also been seen by over 400 year 7 secondary school pupils who have watched performances and participated in workshops. Don’t Stare aims to raise awareness of the issues of hate crime and puts over the key message that being different should not mean becoming a victim. The performance has three possible workshops to accompany it: One for learning disabled audiences; one for a professional audiences and one for secondary school pupils. The workshops are led by Company artistic director, Jess Mackenzie who has had 25 years experience in running workshops. Don't Stare is available for booking and in 2012 will be touring once again to secondary schools and years 5 & 6 in primary schools. If you would like further information or to check availability, please email or call us. Details on the contact page of the website. Magical and powerful small-scale theatre featuring a beautiful set, puppets and original music. Influenced by European folk tales, where magical and scary events can occur and choices are not always as straightforward as they seem, an evocative landscape and a simple tale can reveal an emotional journey. The Boy Who Opened Doors is a moving story about a young boy’s journey into adulthood, his ability to stand on his own two feet and make choices to achieve his goals. Intimate theatre choreographed to an original soundtrack,The Boy Who Opened Doors gently explores issues about growing up and gaining independence by presenting imaginative and creative theatre. Suitable for family audiences 6 years+, festivals, schools, community venues and conferences. Enquiries are welcomed by Nick Baker or Jess Mackenzie. Details on the Contact Us page.